I find myself immersed in old, abandoned content. mpending beta phase or no, Cataclysm's still distant on the horizon. The last several months before an MMO expansion, I am learning, bring on lethargy, sabbaticals, or sudden curiosity about corners of the game-world that raiding never left time to investigate. With Blizzard's introduction of achievements — many rewarding in-game titles and mounts — players have practical reasons to seek out content from earlier in World of Warcraft's current and nearly two-year-old expansion, and even that originating with the game's 2004 launch or soon after. Warmly inspired by JRR Tolkien's dwarven ruins of Moria, Blackrock is an immense place carved from inside of a volcanic mountain.I have been carrying out my own expeditions in an area of Azeroth called Blackrock Mountain. Warmly inspired by JRR Tolkien's dwarven ruins of Moria, Blackrock is an immense conglomerate of a city, a fortress and two legendary beings' lairs carved from inside of a volcanic mountain. These three five-player and two forty-player dungeons were designed six years ago, when the game's maximum level was only 60. I send my strongest, most self-sufficient main character along to do the work of two-score, sending certain treasures to another character so the second one can build reputation points with a now-obscure faction and obtain a hard-to-find enchantment to sell on the server's auction house. Apart from the heroic thrill of felling a dragon or other mastodonic monster singlehandedly, I am arrested by the aloneness of questing in Blackrock and the lands surrounding it. A command allows you to query the number of players nearby: none, most evenings. One of the five-man dungeons is still regularly run by players leveling characters but WoW's new Dungeon Finder transports characters directly to the instance. 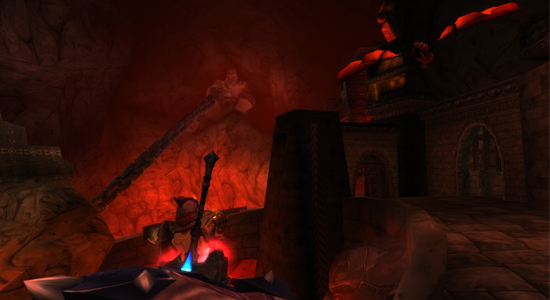 The inside of Blackrock Mountain used to be heavily trafficked by players. Now — not a soul.And the inside of Blackrock Mountain, with entrances to four of the five dungeons, used to be so heavily trafficked by players that net connections would lag and scuffles would break out between factions — a constant, puckish brawling known, and preserved on YouTube, as "BRM PVP." Now — not a soul. Two sentiments emerge. One, a blend of melancholy and objective musing over MMO titles whose growth and progression nevertheless results in abandoned cities, countrysides and such a massive tract of space as Blackrock, as players resist wanderlust and concentrate in areas granting them access to features most important to them. But, two, unexpected immersion in the game as I consider that my characters, alongside thousands, tread where few others have for a long, long time. Whatever pains taken by Blizzard's art department to illustrate age and dilapidation, the mere state of Blackrock makes it palpably secluded and forbidding. Come Cataclysm, two new, Level 85 dungeons promise — in service to the new expansion's principle of returning players to the Old World they left behind in The Burning Crusade and Wrath of the Lich King — adventuring throngs across those lava-dressed spans and ledges of Blackrock Mountain. Welcoming the revival, I may miss the stillness and quiet. The old haunts are much more resplendent when you couple them with friends who have characters that could never appreciate them before. i actually stopped a group of newer players from moving for a few minutes in Undead Stratholme when i said simply. "Look up, the city is still burning." one of them who had had only been playing since BC said, "i never noticed that before". as much as im looking forward to the changes coming in Cata, i'm still kind of sad that some people will have never appreciated the old stuff. It really is a storied game. On a different level, I experienced Karazhan as it was intended — recently, I accompanied guildmates on a run, and at each turn, on each pull, guildies would explain how things used to be. Impressive, and, too, bittersweet.